hey! excellent blog. i normally have a hard time reading lengthy pieces, but this was interesting and engaging. looking forward to more. . Thanks Kate, now that I know someone is reading it, I will try to churn out some more. I have never read such crap on the Internet as this. You can pick and choose statistics to meet your criteria, also JUST IN CASE YOU WEREN’T AWARE OF THIS, all data provided to these organizations originate from the Cuban government and they are not confirmed numbers from a third party, so the Cuban government can report that they have 100% birth rate and no one can verify if the data is correct or incorrect because they DONT allow anyone to confirm thier numbers. Before you post something as illitarate as this, typically Cuban propaganda, why dont you state the facts of limited freedoms in Cuba, food shortages when the Cuban govermnet is allowed to trade with the entire world despite the embargo yet still the people suffer from hunger because the government selects to invest their money on defending from an imaginary invasion from the U.S., frequent power outages. Did you know that befor ethe Castro revolution, Cuba was among the top countries in Latin America statistically, above Argentina and Chile, and currently they are compared to third world countries such as Haiti. 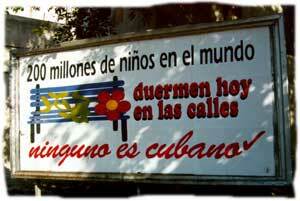 This is a JACKASS post that only serves to convince those people who know nothing about Cuba and the Cuban people. LEARN YOUR HISTORY!!!! I also mentioned that the U.S. government does the same thing, Here is a comment from the Miami 2005 non-violent protest of the FTAA. And Cuba is allowed to trade with the whole world are they? Thats interesting, do you have a source? Cubans are not starving, you need to do just a tiny bit of reading to understand that. They lost there ability to feed themselves when the Soviet Union collapsed. ALL imports ended, and they began to relocalize their food production. In fact, if you just read what I wrote, you would know that. But you didn’t did you? Come back and try again, after you educate yourself about the issue. Or at least read what I wrote before you start with the verbal attacks. Its quite childish. Which is also my point. I am pointing out hypocracy, not propping up the Cuban government. Did you know that befor ethe Castro revolution, Cuba was among the top countries in Latin America statistically, above Argentina and Chile, and currently they are compared to third world countries such as Haiti. Thanks for dropping by Mario, leave out the profanity next time, and I will not delete your post. Just a couple grammar points.”because almost all reports of it, come from either the US media, or Cuban’s who disapprove of the Cuban government.” Should be “Cubans” not “Cuban’s” , whereas in “So there it is folks, right from the horses mouth” , “horses” should be “horse’s”.